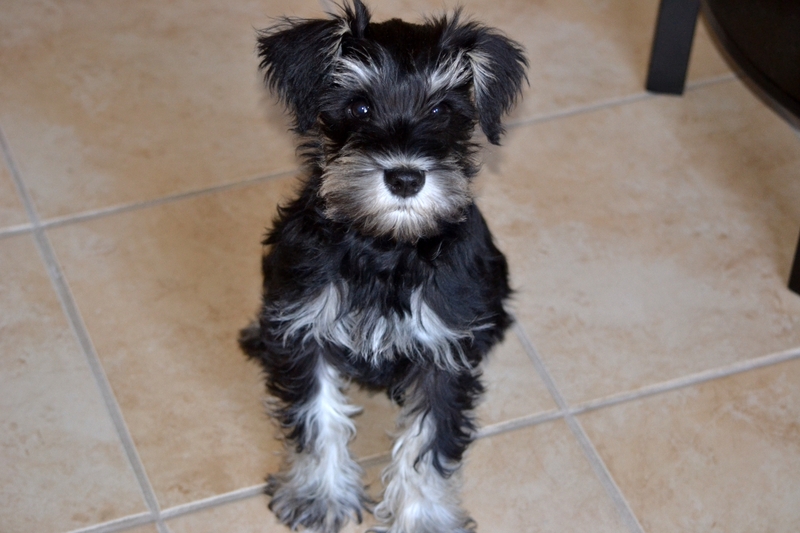 As of Sunday our miniature schnauzer, Frankie, will have been with us for a full month, but he has already made our lives so much better, fuller, and perhaps … a little more exhausting. Next Tuesday will mark Frankie’s 12 weeks of age and I’m in absolute awe with how intelligent he is; he’s amazed my husband and I in ways that we couldn’t imagine. On the other hand, he’s tested our patience in ways that we didn’t want to imagine. 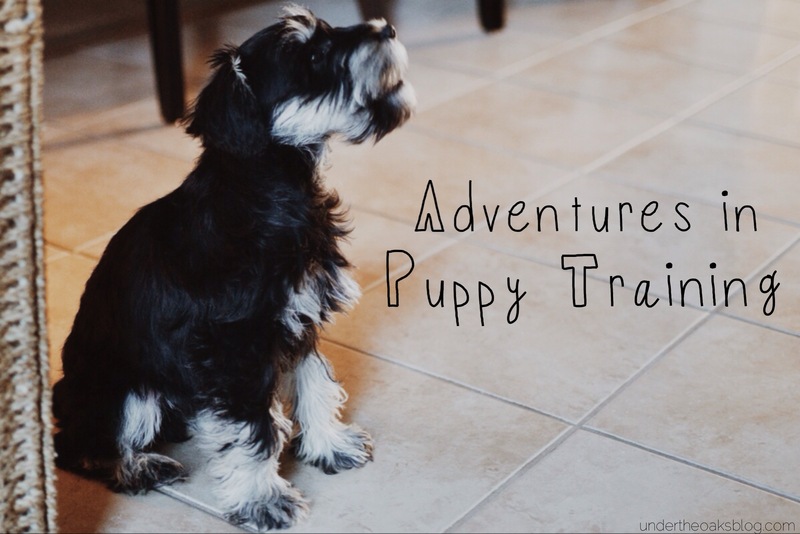 And so the adventures in puppy training have merely begun. 1) Learned to sit! 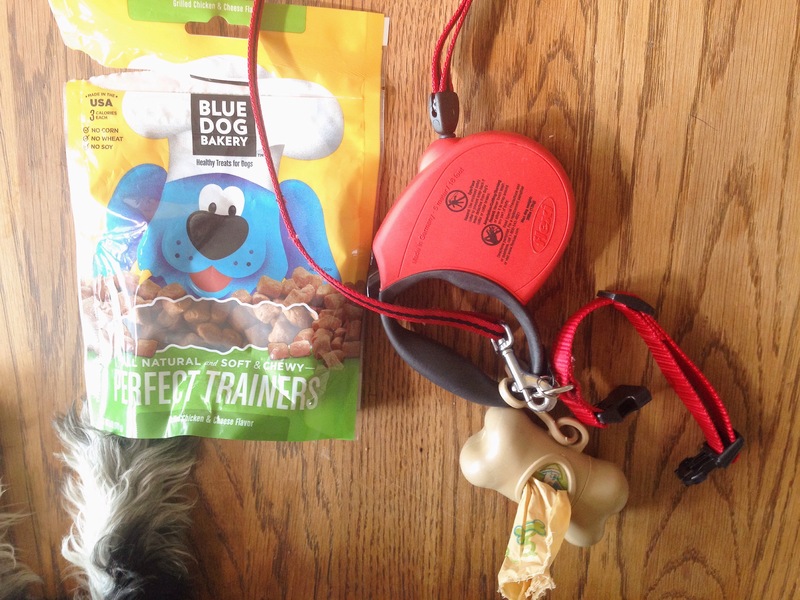 We attribute sit to training treats, but he does it on command … most of the time! When he’s excited and playing we aren’t so successful, but if he’s following us around or we are practicing with treats he’s got it. The key to this command or others, is to do them in short periods of time and with lots of positive reinforcement (treats, praise, or play). 2) Is 90% house-trained. In our four weeks together Frankie has had a total of 6 accidents in the house which we’ve blamed ourselves for. Only 6 accidents for a dog that is 12 weeks old and was never trained to go outside prior to living in our home? Success. 3) Sleeps through the night in his crate. He’s done this since night 1 really, and after using a crate I think I always will in the future. The first night he whined minimally in the middle of the night, but I think that was also a little bit of my own mommy insecurities. Since then we put him to bed in his crate at 10pm and he sleeps all the way until 7am when we wake up. Not once has he had an accident in his crate. The key: make the space only big enough for them to stand up and turn around. As he’s grown I’ve gradually made his crate space bigger and bigger. 4) Keeps himself occupied. At first I was worried about separation anxiety because every time we left the room he’d whine and cry if he couldn’t see us. Understandable since he’d spent his first 8 week surrounded by his brothers. Now that we’ve removed barriers and let him roam the ground floor of our home he will mostly follow us around, but when we are relaxing he will play with his toys on his own. 5) Walks on a leash. He fought it at first and would scratch heavily at his neck whenever we would put his collar on him, but through persistence he quickly got used to it. We also have him on a leash every time we take him outside for a potty break, so the repetition has also been key. 6) No more nipping. At first he wanted to do everything with his mouth, but anytime he would nip us we’d shout “OW” really loud which would shock him and he would stop. Now it is very rare for him to nip at us, but boy does he love giving kisses. 1) Socialize, socialize, socialize. He hasn’t been able to be around other dogs quite yet because he has one more immunization to go, but we cannot wait to socialize him with others and their dogs. Currently he barks a loud “Hello!” when he sees other dogs out the window or through the fence and I’d like for him to say hello with a nice tail wag instead! 2) Curb the barking. Right now this isn’t a big issue. However, I could see it turn into a bad habit. Also, we’re told this is a problem for his breed of dog, but we think through patience and training it doesn’t need to be a problem. 3) Learn commands such as come, stay, let go, and DOWN! We’ve got sit, but he only will sit if he’s not overly excited so we look forward to learning and practicing commands in the company of others and with professionals that know their stuff. The command I look forward to the most? DOWN! 1) We love Victoria Stilwell, dog trainer extraordinaire, in our household and she currently has a series of about 52 short episodes on eHow’s YouTube Channel. She’s both positive and patient, the two most important characteristics to training a dog. 2) Cesar Millan’s channel on YouTube is also really great for dog training, or rather getting to know your dog a little bit better. He’s also very upbeat and positive in his short segments. Agree, so important. At first we weren’t as conscious about establishing a leader role because we were caught up in the change and the new puppy energy, but we’ve been more conscious about it as we’ve grown our relationship with Frankie.